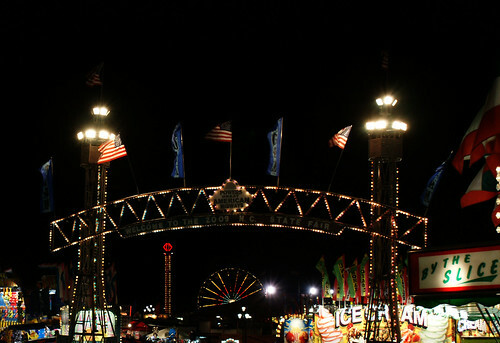 I nearly forgot what it felt like to walk through the gates of a fair. It's been so long since I've been to one, it's no wonder. The lights.....the smells....the sounds. 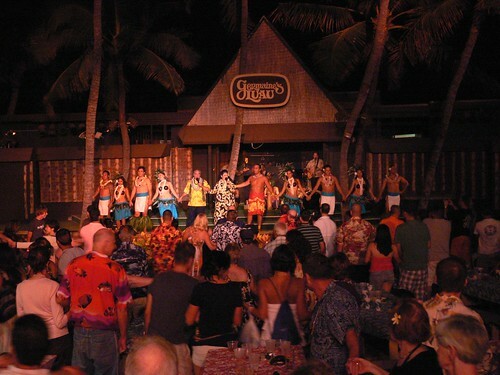 They all compound to cultivate an evening filled with good times and lasting memories! It's almost too much to take in since everything hits you all at once, kicking your sensory overload into hyperdrive. I swear that I was on the brink of explosion as I attempted to take it all in. Aside from making our minds up about what we wanted to do first, there was also the dilemma of trying to gain your bearings in a land where every corner looks exactly the same as the last one you passed. 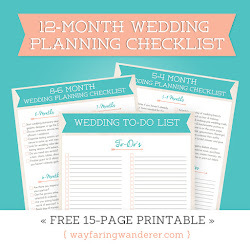 We were completely overwhelmed by the amount of options they had available. 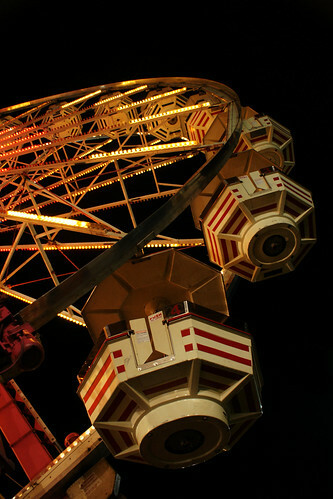 Between the food, rides & other fun stuff, everywhere you turn is a sea of potential gluttony just waiting for you to give in. Giving in to your whims in this place is unavoidable! 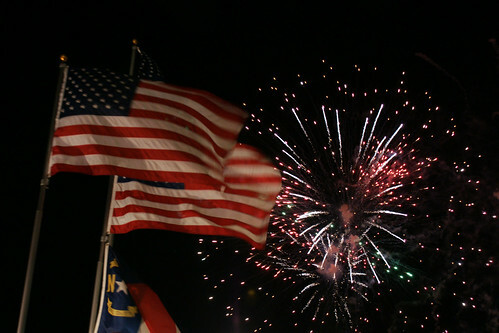 The NC State Fair in Raleigh, NC is supposedly the biggest and best fair in the state. 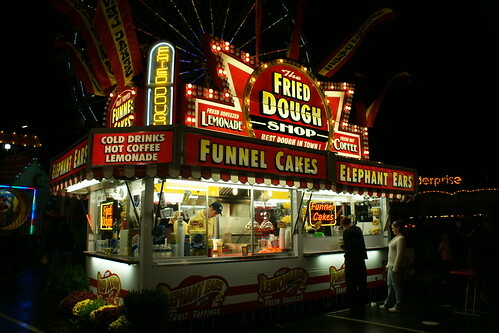 While I haven't been to many, I can definitely say that this fair takes the "deep-fried cake". It was positively massive! We walked all over the place, and got a pretty good workout, before finally making a decision on what we would do to jump start our evening . Since the best place to survey the entire grounds would be from the air, what better place to get a grand view than from a ride on the Ferris Wheel! I was hoping that we would get stuck at the top for a moment or two so I could take a photo, but we didn't. 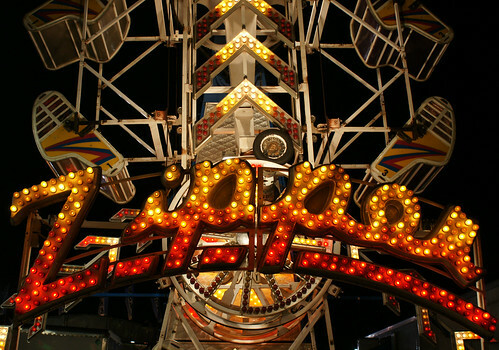 And to think, we almost waited until daylight hours on Sunday for our fair fun. I'm glad we didn't because I am a huge fan of all the lights, it's much more dazzling in the evening. After our ferris wheel foray, we elected to get some grub. Good thing our insatiable appetites are only met with these indulgences occasionally. 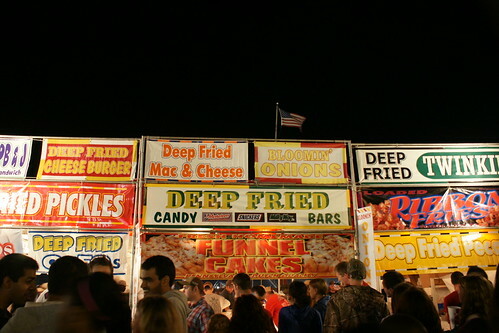 Otherwise, those deep-fried delectables would greatly lower a persons life expectancy! food.....you get the idea. 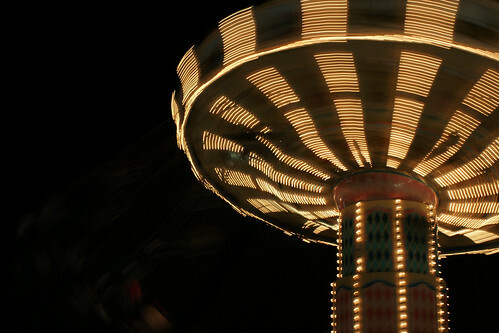 At first, our reasoning was that we didn't want to eat too much all at once or else we would get sick when it was time to be thrashed around on a ride. 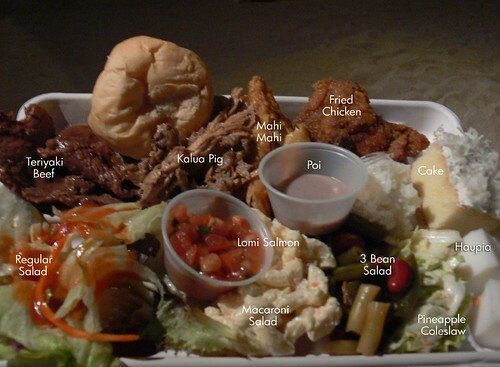 Thankfully, our tummies were tame and didn't disagree with any of the tasty tidbits we were consuming. You know, to have as many vendors and food options as we did, we were quite subdued compared to our normal ravenous natures. 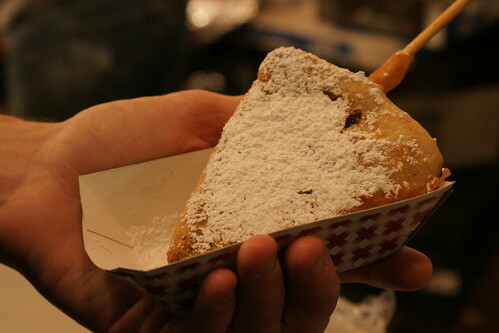 Our favorite fodder was most definitely the deep-fried pecan pie! Yep, you heard right....deep-fried pecan pie! They deep-fried just about everything in this place, mac & cheese, pickles, butter (?!?! ), candy bars, it was pure ridiculousness! The only reason I can come up with as to why we didn't have anything more than a foot-long corn dog, slice of pepperoni pizza, roasted corn & cotton candy (for the road) was that we were off our game, or maybe just spending wisely, or perhaps we were just crippled by indecision, which might explain why I didn't get my sausage with onions & peppers and why Cody didn't get his giant turkey leg?! Who knows. Not all of the sights to see along highway 83 were quick stops. 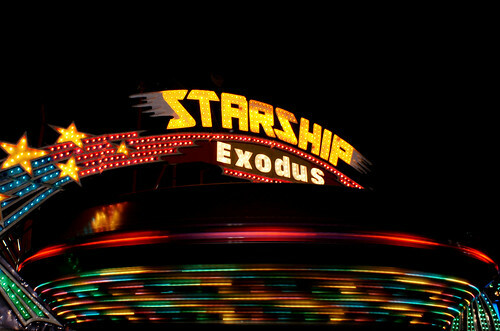 Some attractions required a bit more time to explore. One of the coolest things I got to do while in Hawaii was snorkeling! My friend Tawny took me to Shark's Cove to get my feet wet. 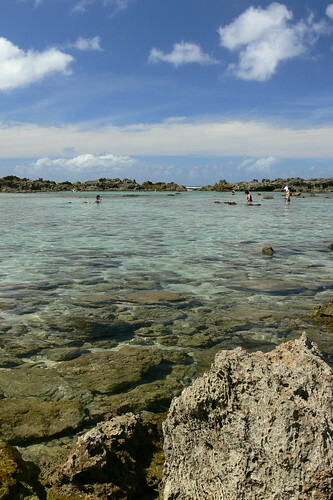 Apparently, it is one of the best places to go snorkeling for free on Oahu. Even though I don't have anything else to compare it to, I can definitely confirm that it was an incredible place. After a brief demonstration from my good friend I was ready to take the plunge. As I meandered atop the surface of the clear water I remained in a constant state of awe as I caught glimpses of the amazing little underwater creatures in their natural habitat. I have always wondered what it would be like to poke around and peek at the aquatic life living beneath the surface. 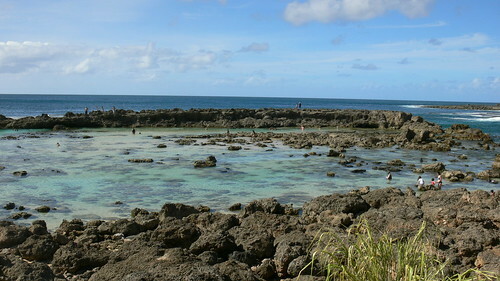 Snorkeling is definitely an adventure you shouldn't skip while in Hawaii. Oh, and don't be like me and forget to bring an underwater camera! 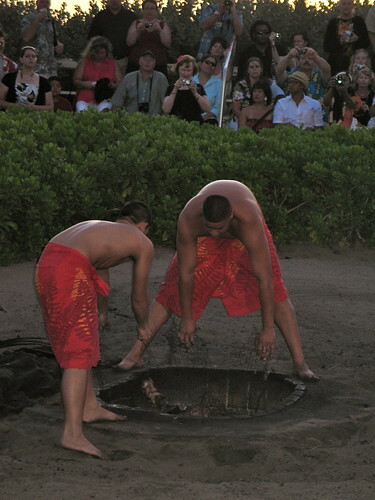 There are, however, some hazards involved that you should keep in mind when you get the urge to submerge, like the crazy sharp lava rocks between you and the water. They are a little tough to navigate barefoot, so be careful! You should also avoid touching the reef as you can severely threaten the survival of those very delicate environments that many species rely upon to subsist. 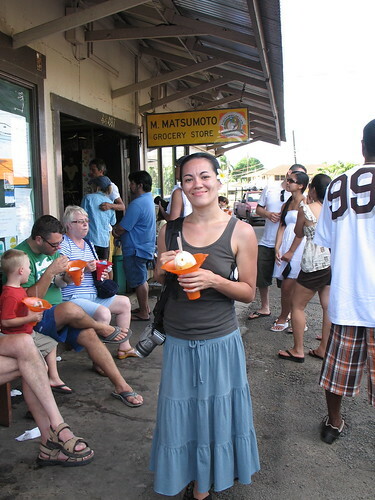 After our fun in the sun, we headed over to the town of Hale'iwa so that I could try one of these famous shaved ice sweet treats from Matsumoto's that I've heard so much about. You can tell that this is the place to go by taking one look at how long their line is. Stretching out to the parking lot seemed to be the norm, but it didn't take very long to reach the front of the line. Besides, I had trouble making up my mind about which flavors I wanted to try so I needed some extra time. I finally decided to go with a combination of guava and lilikoi (passion fruit) flavored ice on top of vanilla ice cream and red beans covered with condensed milk to add an extra layer of sweetness to the mix. Talk about yummy! 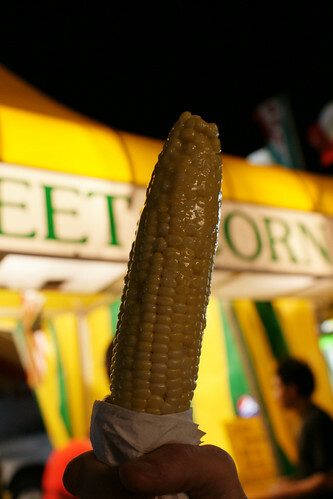 I instantly understood why these delicious cones were so popular. 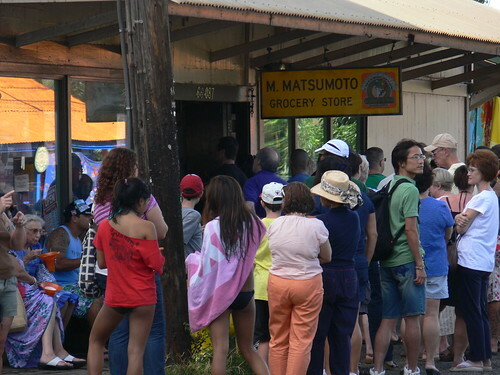 Matsumoto's opened as a grocery store in 1951. Now, it mainly sells shaved ice and souvenirs to tourists. 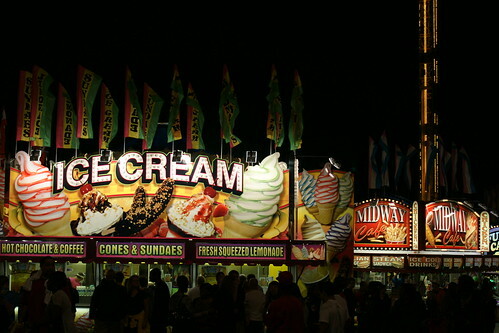 They can serve upwards of 1,000 tasty treats on a hot summers day! Believe me, you want one. 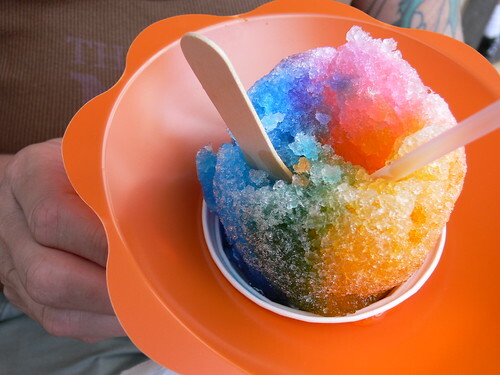 I want one right now, actually. 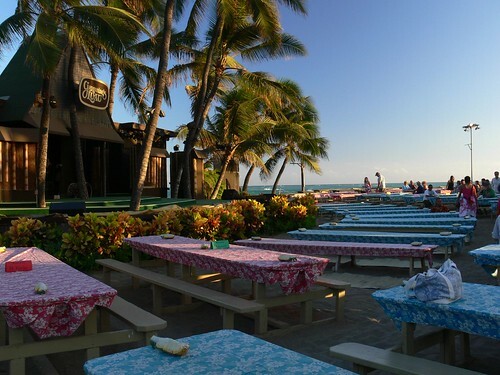 The town of Hale'iwa isn't directly on Highway 83, but this is definitely a detour you want to take when you find yourself on the North Shore of Oahu. This last sight was one that I briefly stopped at during my drive along Highway 83. While looking at this relatively calm scene, it is hard to believe that in the winter months ocean swells pound Waimea Bay with 30 foot waves. 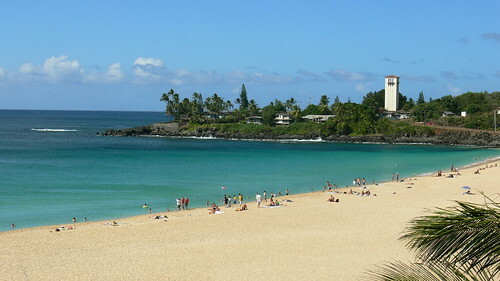 During that time surfers from all over the world find themselves at this beach clamoring to catch a wave. You wouldn't think that the summer would be the slow season, but it is! I had so much fun taking the scenic route along Highway 83. In a few short hours I covered a lot of ground. 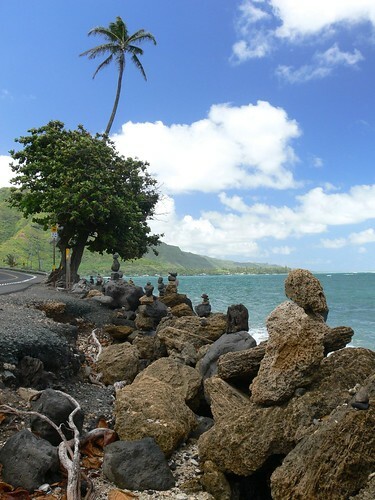 The picturesque shoreline drive took me from Kualoa on the Windward side of the island to Hale'iwa on the Northshore. The sheer beauty of the scenery along this stretch of road is unsurpassed by anything that I've ever seen. I think that it would be nearly impossible to travel that way without deviating from your course. Just let the wind take you where it will, you won't be disappointed! If you missed Part 1 of the 6 Sights to See on Highway 83, click here. 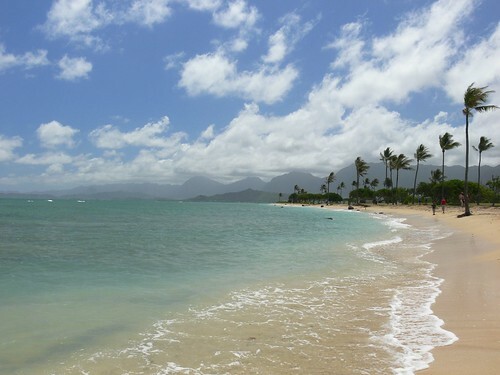 One of the prettiest shoreline drives in Oahu is, without a doubt, Highway 83. 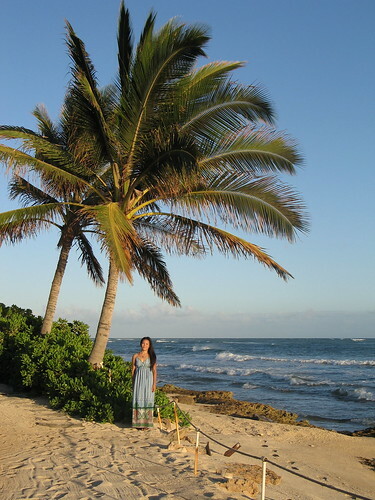 This picturesque driving tour with its miles of crystal blue pacific ocean was truly captivating. Imagine how hard it was for me to keep my eyes forward, especially during those times when the road was hugging the ocean so closely! My only plan was to cruise this stretch of highway at a slower pace, and to stop whenever something caught my eye since no agenda was planned beforehand. 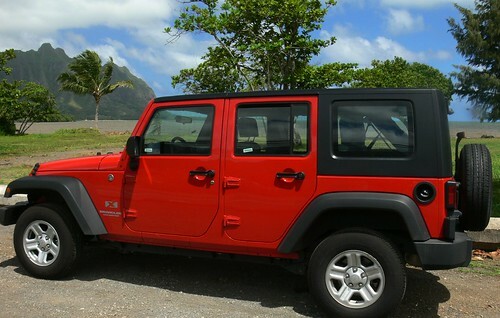 I lucked out when searching for a rental car deal online, and scored this sporty whip for my week in paradise! 1.) 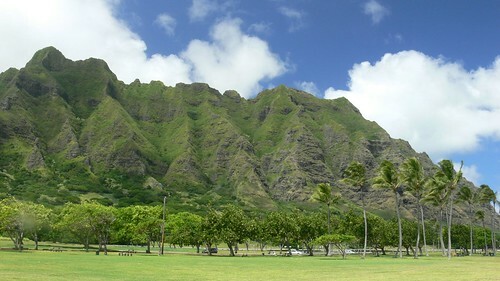 The first stop on my coastal tour along the windward side of Oahu was Kualoa Beach Park, which sits at the edge of Kane'ohe Bay. Had I not already eaten lunch this oceanfront park would have been the perfect place for a picnic. 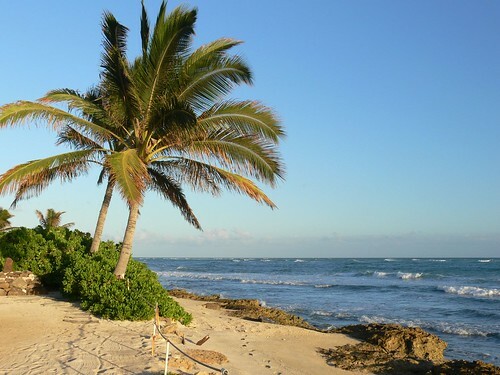 A seemingly endless lawn is matched by a sandy strip of beach that stretches as far as the eye can see. 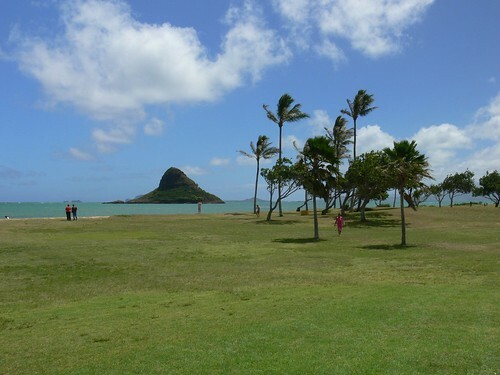 The 208 ft high off-shore island seen from the waters edge is known as Mokoli'i Island or Chinaman's Hat. Even if you can't muster the courage or stamina to swim the 614 yards it takes in order to reach the island, viewing it from afar is as good as it gets, although I have heard that it's easier to get to during low tide. 2.) This roadside attraction wasn't anything you would read about in a guidebook. Chances are they might not still be standing, but if they are, you'd want to see them! As I made my way from town to town, out of the corner of my eye, I noticed these statue-like figures teetering on the edge of the pavement. Quickly, I found a place to turn around so I could investigate further. I was able to park at the Crouching Lion Inn (around mile marker 27), which was right across the street. 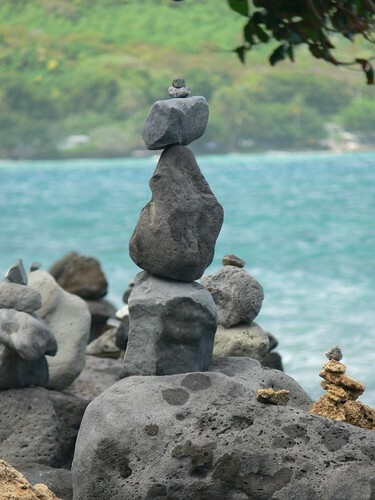 What I found as I crossed over to the other side were a grouping of rock cairns balancing in between the ocean's crashing waves and speeding motorists flying down the highway. I was amazed that they remained unscathed. 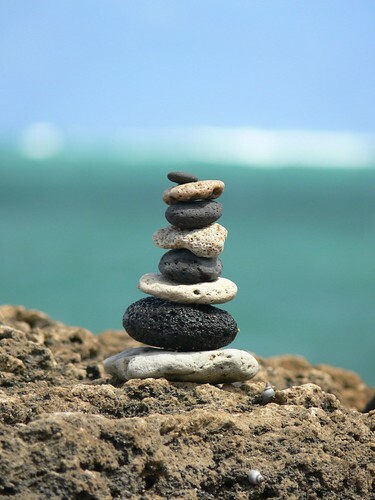 But that's precisely why rock cairns are so special to begin with. 3.) 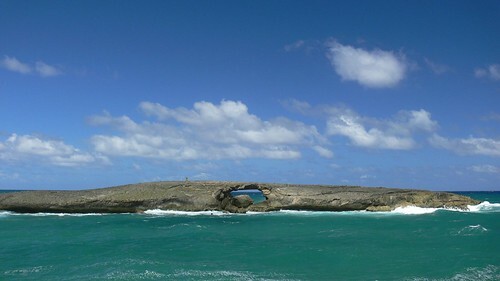 La'ie Point: From this sandstone point you get a grand view of the natural arch that was carved by a tsunami in 1946. Yep, the tsunami punched a hole in the rock! 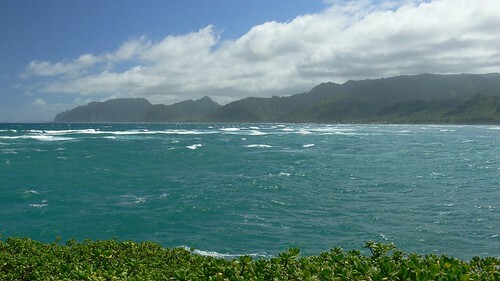 To the right of the off-shore island you get a good glimpse of the windward side of Oahu. While this site offers great views, it only takes a short time to visit. Okay, maybe it was a little boring, but it was still cool! I think that it would be an absolute shame for anyone heading to the island of Oahu to forgo seeing this side of the island because they're planning on staying around the heavily populated cities. The areas from Kane'ohe (Windward) to Hale'iwa (North Shore) are some of the most beautiful sights I found while driving around Oahu, but they can't be easily accessed like most of the sights found around Honolulu or Waikiki. 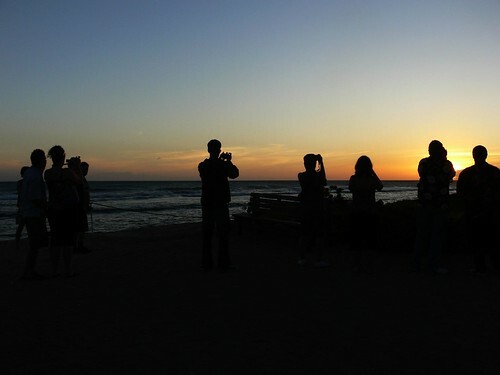 Even if you rented a car for one day, it would be well worth your while to experience the pleasure of driving along one of the best highways while visiting Oahu! In my next post I will share the other 3 Sights to see along Highway 83! Update: Now posted! Click below.